January has been mild here in New York so far, but we’re moving into that time of year when winter becomes a reality. The holiday lights have been taken down, the new year’s commotion has passed, and we stare ahead at a long few months of slush. I’m a cold weather person at heart–a homebody who secretly relishes any opportunity to nest–but even I feel susceptible to gloom during this seasonal stretch. 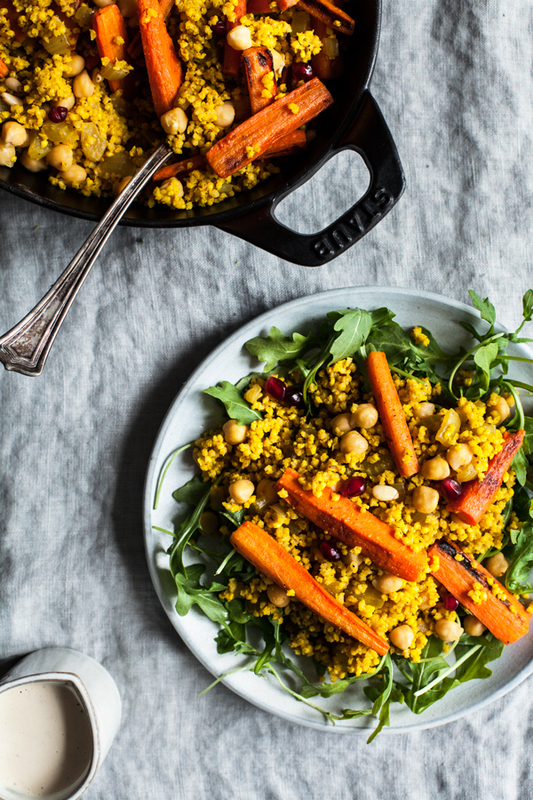 I fight back with as much colorful, warming food as possible, and this golden Moroccan millet & roasted carrot pilaf is my latest antidote to grayness outside. It took me a long time to warm up to millet; when I first tried it, it seemed dry to me, less fluffy and flavorful than quinoa and less dense and substantive than farro or barley. Over time, I’ve come to appreciate its mild sweetness and its texture, which is perched nicely between the lightness of quinoa and the heft of rice. 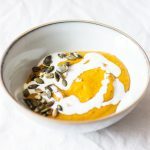 Still, there have been some prerequisites to really loving it: one option is to mix it with quinoa (as in this lovely, lemon-scented whole grain breakfast porridge), which seems to offset millet’s tendency to get dry. Another is to fold the millet together with lots of moist, flavorful ingredients, and plenty of bold seasonings. And that’s exactly what’s going on in this Moroccan-inspired pilaf: the millet is cooked with onion, celery, spices, and a little extra liquid than is generally suggested (it’s usually a 1:2 ratio of grain to water or broth, but I used 2 1/2 cups broth for a cup of millet). 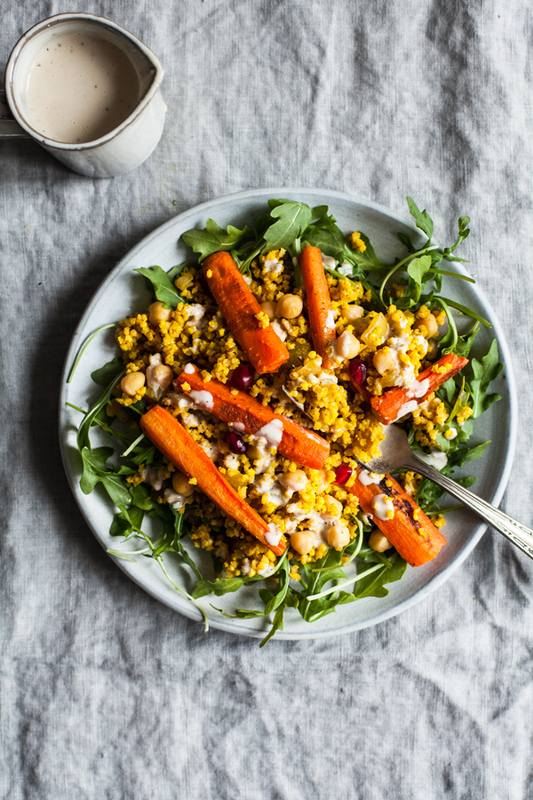 After it soaks up the spices, it’s combined with sweet, spice roasted carrots and drizzled with lemony, garlicky tahini dressing. 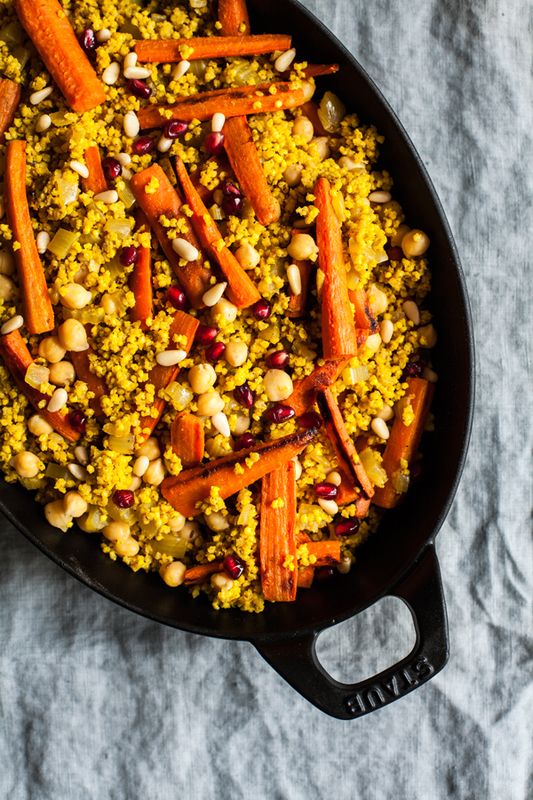 The result is a millet pilaf that’s bright and flavorful, sweet and savory, and really beautiful to look at. 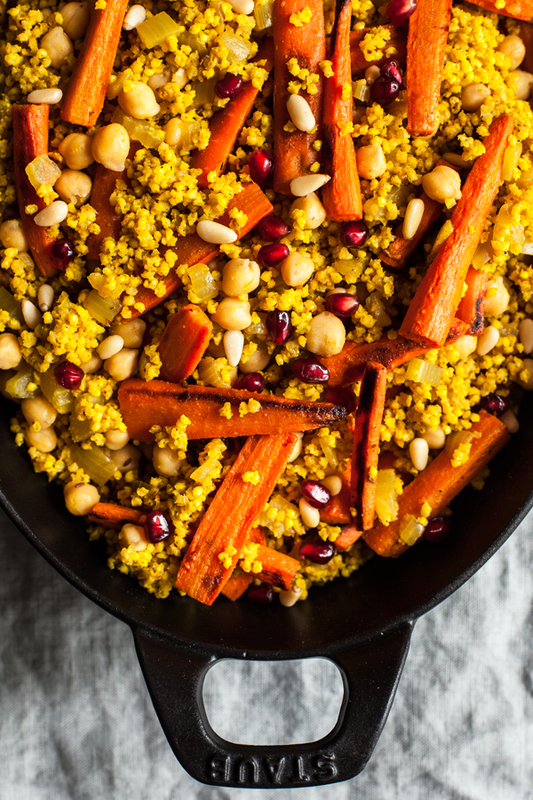 A pinch of turmeric gives the millet its orange hue, and I threw some pomegranate seeds and pine nuts on the finished dish for extra color and crunch. Chickpeas add plant protein and texture contrast. 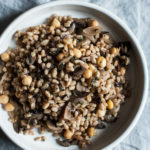 I love how their sturdy shape holds its own in the pilaf, but you could use cooked lentils, white beans, or adzuki beans instead. Preheat your oven to 400F and line a baking sheet with parchment or foil. Toss the carrots with 1 tablespoon of the olive oil, maple syrup, and ground cumin. Transfer the carrots to the baking sheet and sprinkle generously with coarse salt and black pepper. Transfer the carrots to the oven and roast for 35-40 minutes, or until they're gently caramelized. While the carrots roast, heat the remaining tablespoon olive oil in a medium sized pot. When the oil is shimmering, add the cumin seeds. (If you're substituting ground cumin, add it when you add the broth and other spices instead.) When the cumin seeds begin to smell fragrant and sizzle, add the onion and celery. Cook for 5 minutes, stirring frequently, or until the onion is soft and clear. Add the millet and continue cooking for another 2-3 minutes, or until the millet smells slightly nutty. Add the vegetable broth, salt, turmeric, coriander, cinnamon, and red pepper flakes. Bring the mixture to a boil. Reduce the heat to low, cover, and simmer for 18-20 minutes, or until the liquid has been absorbed. Remove the millet from heat and allow it to sit for 10 minutes. While the millet cooks, whisk together the lemon garlic tahini dressing. Add water by the tablespoon as needed to achieve a consistency you like. 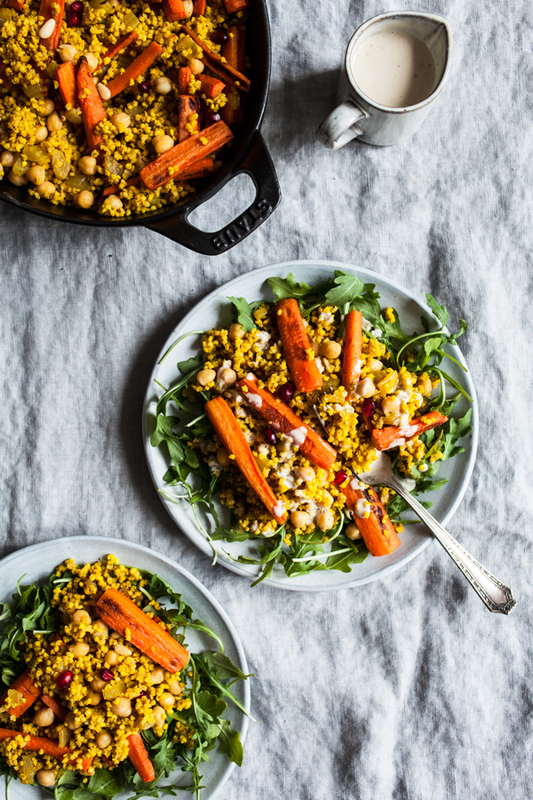 Fluff the millet gently with a fork, then fold in the chickpeas, roasted carrots, and lime juice. Taste the pilaf and adjust salt and pepper as needed. 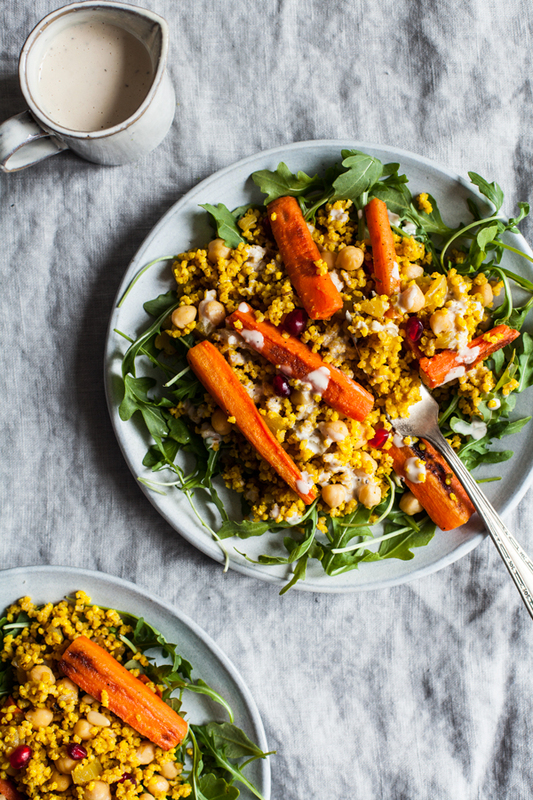 Serve the pilaf over a bed of fresh arugula, if desired, and top with chopped fresh herbs, pine nuts, pomegranate seeds or molasses (or all of those). Drizzle generously with the lemon garlic tahini dressing. Leftover pilaf will keep for up to 3 days in an airtight container in the fridge. As you can see, I’m pretty loose with my spice and seasoning suggestions for this recipe. 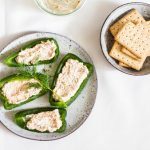 We all have different likings for heat and intensity, so feel free to boost any of the spices, to use a heavy hand with the crushed red pepper flakes, or to amp up the garlic in the lemon tahini dressing. If you have harissa paste or powder at home, you can try adding it to the carrots before roasting for extra flavor and heat. You can also try throwing some raisins, currants, or sliced apricots into the pilaf if you’d like more sweet and savory contrast. It’s all good. Wherever you are, and especially if you’re face to face with gray skies and chilly days, I hope this pilaf will brighten your day and lift your spirits. Enjoy it. I’m making this tonight, subbing craisins and pistachios for pomegranate arils and pine nuts because that’s what I have on hand, and since I make lemon tahini dressing all the time I decided to try out your creamy cashew carrot dressing with it instead (although I plan to incorporate some tahini into it)- will report back! Your site is looking so bold and beautiful and colorful and cheerful — everything I need in my life right now!! Thank you for your constant inspiration. Funny story: I bought a 50 lb. bag of millet from Amazon so that I could make my favorite granola whenever I want. Turns out 50 lbs is a lot. Thank you for inspiration on the millet front — this looks so good and nourishing. Also hi and Happy New Year!! This looks amazing! I should really try to cook this enigmatic vegetable.Thanks for sharing this great pilaf. this tahini sauce IS TO DIE FOR. gena, bottle and sell it! my carrots were undercooked–i roasted them whole and they needed at least 45 minutes. i also could have been heavier-handed on the spices. this is a great winter recipe though, and helped kick me out of my cooking slump. Glad you enjoyed it! And your comment made me realize that I’d forgot to include instructions on cutting the carrots (because I didn’t roast mine whole). So, apologies to you for the extra time it took, and thanks for inspiring the correction. I should really try to cook this vegetable. I will make it for tonight. This looks AMAZING and so colourful. I’m adding this to my food plan this week, thanks! This was so flavorful and delicious. I enjoyed the leftovers for days and I will definitely make it again. I couldn’t find a pomegranate anywhere, but hopefully I can next time I make this. It would be great to bring to a potluck. The roasted carrots are the star of the show!